This is a sign from the Angels that you’re on the right path! Keep going. Work with your Angels by asking them for additional guidance, clarity, motivation, strength, signs, support, and inspiration related to your dreams and Divine Life Purpose. Follow the guidance that comes. As the energy continues to rise upon the Planet, rise with it by opening your mind and heart, and release limited, logical thinking and illusions. 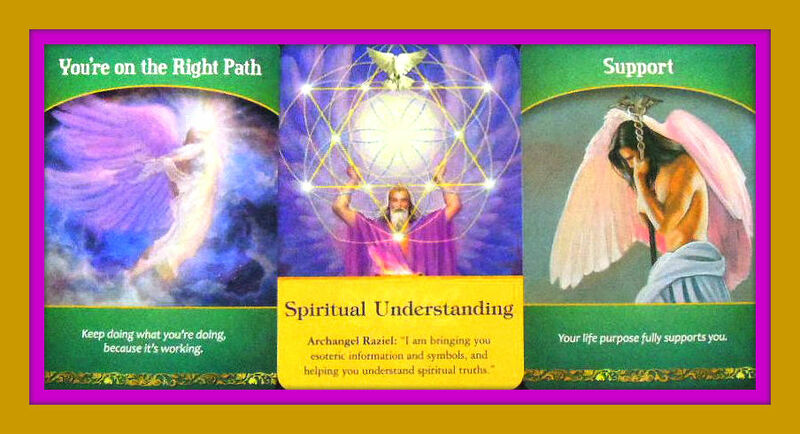 Call upon Archangel Raziel, the wizard and alchemist of the Archangel realm, who can help you to understand ideas that defy normal logic, and manifest your dreams into your reality. Remember, things are not always as they seem. As long as you stay fully committed to your Life Purpose, hold positive intentions, and follow your Divine guidance, you are fully supported by all of Heaven. This is especially applicable if you are making a career transition from a job that once offered you some financial security, but now your heart is no longer in it and your body is rebelling. There is more to life than dollars and sense. Trust that your needs will be met, and continue to call upon the Angels, your guides and your Higher Self for guidance. Stay grounded and hold on tight. Please let me know if anyone would like to continue seeing these posts!